Sir Messer of the Knight’s Fowl, an order of knights I’ve just imagined into existence. Be wary, though new, they’re a nasty bunch indeed. Today’s drawing-a-day, a knight on a hill. 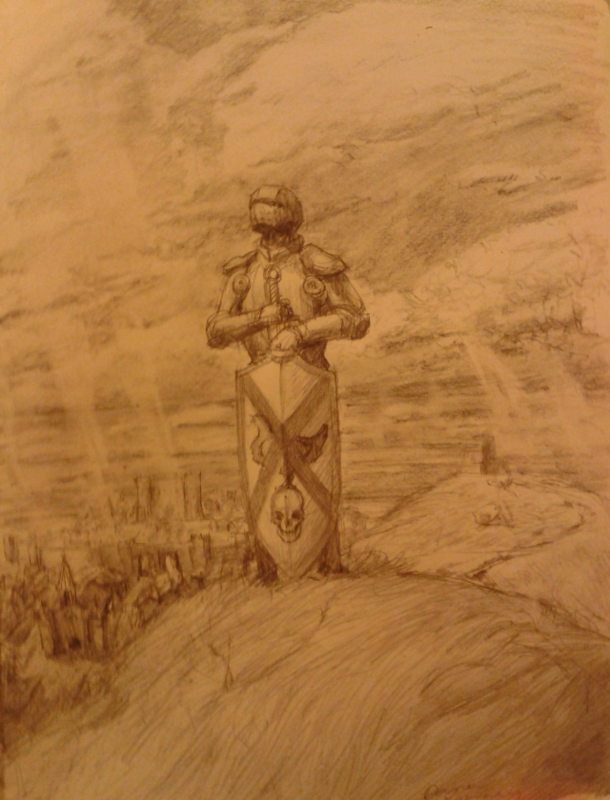 This drawing started out as a little sketch of a generic knight character looking up to the sky. The issues that jump out at me first are the awkward head and neck – the neck is too long and the head doesn’t look to be angled correctly. The next thing I notice is the armor is off. The gorget is too small, offering no neck protection and the shoulders appear awkward. The arms and hands are weird looking. The position of the shield simply obscures the waist and legs so I didn’t have to draw them – a lazy way to get the sketch done in less time. So, in order to improve for next time, I simply need to put more time into the initial working drawing phase, to get the proportions and positioning as accurate as I can. When I’m happy with that then I can indulge myself in tonal drawing or details.